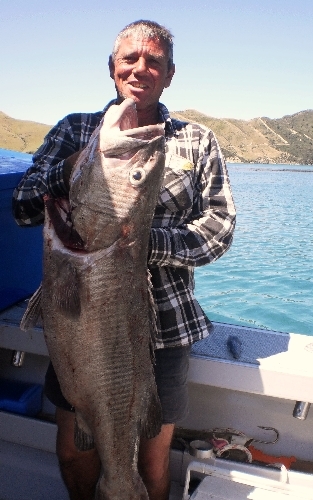 Dan and I sat in a Coromandel café in early April discussing our annual North Island trout-fishing trip. The outlook was bleak. We had already pushed the trip back a few days due to heavy rain blowing out rivers in Hawkes Bay; the forecast was for more heavy rain later that day. 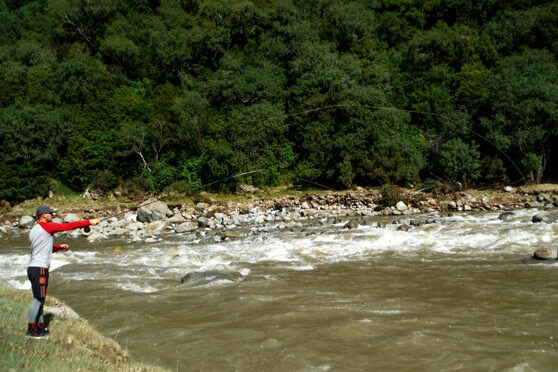 However, we decided to leave the next morning anyway and wait for the river to drop, as Dan had flown up from the South Island for this mission and I had scheduled a week off from work. Besides, we had nothing better to do. Getting out of the Coromandel in rough weather can be tricky. By the time I finished work around 3pm, it was absolutely bucketing down. If we waited until morning we might be stuck due to road closures and flooding, so we threw our stuff in the old Rav4 and gapped it all the way down to Gisborne. As it turned out, it would not have been possible to leave the peninsula the following day. Dan and I like to fish large streamers – it’s an addictive form of fly fishing that targets the larger predator trout. For the first couple of days we ate extremely well, drank plenty of tea and coffee, and tied big, articulated streamers. 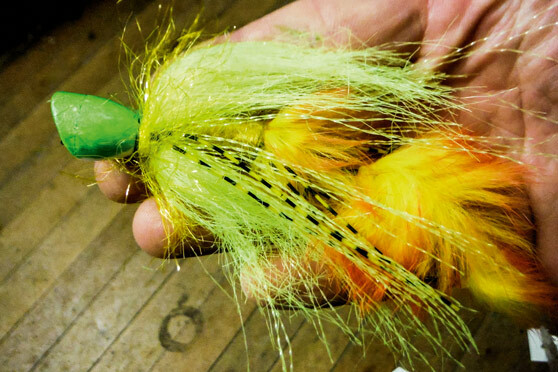 Flashy materials, along with bright white, yellow and chartreuse feathers and synthetic materials, were on the tying table. The unusual conditions meant some out-of-the-box ideas were explored, such as massive bright poppers and flies with rattlers: we had to give the trout something they could see and maybe hear. Each day we drove to the river and checked the conditions. Finally, we found the filthy river was much lower on Saturday, so decided to gear up properly and thoroughly fish a particular stretch the next day. On Sunday morning the river was still like chocolate milk, but seemed to have calmed down and cleared ever so slightly. We therefore streamer fished with determination and a more positive vibe. After an hour or so we came to a nice little side pool surrounded by large boulders, where I sat down for a snack and contemplated what we were actually doing. I was beginning to lose hope. Bam! I watched his rod flex and, sure enough, he was into a nice brownie of around 2kg. I netted it for him, took a couple of quick snaps, then released that beautiful brown buck. Just like that, our hope was restored! Grabbing my rod, I was determined to match Dan’s success, and shortly thereafter I had my first hook-up on a bright, flashy, white and chartreuse streamer. Another brownie, a bit smaller than Dan’s, but a nice fish nonetheless. However, the rest of the day yielded nothing. The next morning saw us leave nice and early, walking upstream towards the gorge. 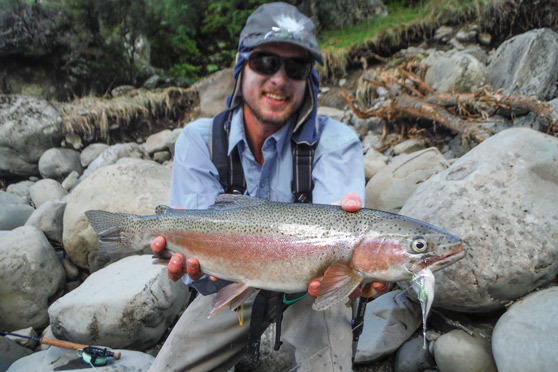 The first big pool yielded a nice rainbow for Dan, the first of the trip, on another of his bright-white flies. He had cast several times into the same area to be sure that a fish could find his streamer. We then carried on upstream, diligently fishing every likely hole. With a river crossing out of the question, I also worried that we would reach a point where we had to turn back – another good reason to cover the water thoroughly. I had a double-streamer setup in action. The lead fly was nothing more than a heap of gold flash and some dumbbell eyes tied onto a hook. Many fly fishers would like to believe that it takes more than that to fool a trout, but in the dirty water we were fishing, presenting something that the fish could see was more important than subtle detail. I systematically worked my streamers through a small pool littered with submerged boulders and different micro-currents. Success came from the far side of the pool in some slack water, with a nice brown trout swimming out to eat my gold fly. It was a bitter-sweet experience for me – I knew the fly was going to catch a fish, but didn’t like the basic concept involved. As the morning wore on, Dan and I missed a few fish, but at least the streamer action was on. All we had to do was turn those short strikes into hook-ups. I decided to tie on a big yellow Game Changer, thinking maybe something bigger would entice an opportunistic hog to eat. The first upstream cast into some slack water close to the bank saw the bulky synthetic fly sitting on top of the water for a few moments. So I gave it a quick strip – and a brownie came out of nowhere to take it off the surface, but missed! At this point we felt it was worth trying different things: the water seemed to be slowly shedding its brown colour to turn a more olive-green. A big white, chartreuse and silver, jig-style fly accounted for my second fish of the day, while being stripped quickly from upstream near a boulder at the head of a small side pool. It was now well into the afternoon; it had been hard work, but what an experience! Eventually it was time to be heading back down towards the car, but we hung in for a bit longer trying to get Dan another shot. Then, with just a bite and a pulled hook for his efforts, we cut our losses; it was more important to get the nasty rock climbing behind us before dark. Upon making it back to the pool where Dan had caught his fish earlier that morning, I found myself busting to pee. I was therefore literally caught with my pants down when Dan started hollering. Turning around, I could see his rod well bent. As I was on netkeeper duties, I charged down the bank holding up my waders with one hand, and helped him land a nice rainbow he’d enticed with a yellow Game Changer fly. He’d definitely earned that one! The following day was our last, and it saw us pushing upstream towards where we’d left off the day before. Fortunately, the river had dropped further and the colour had improved to a dirty olive-green. We really felt this would be the day when the streamer fishing really turned on – but we were mistaken. Both of us caught a fish early in the day, and made it up to the gorge, but there was less action than the day before. Mixing up techniques, tactics and flies kept it interesting, but nothing proved to be a winner. On the way back Dan snapped his rod’s tip section on a back-cast (maybe the line wrapped around his rod, who knows?). By the time we got back to the car, we were both shattered; it had been a valiant effort. The next day my girlfriend Sam rang me to make sure were on our way out, as a cyclone was headed our way – our timing couldn’t have been better! Looking back on the trip, I think we did pretty well to catch any trout between the two big April storms. I don’t think anyone else would even have tried to fish that water, instead using the conditions as an excuse to spend a week-long holiday at the pub. I’m proud of the fact our patience and determination gave us a notable degree of success in the face of adversity.